Create an app that includes multiple components. Describe the file structure of a complex component. You’ve built a component and pushed it to a scratch org. Let’s start adding some interactivity with event handling. We follow an event’s journey through several components for sophisticated event handling in an application. This application is a product selector for a bicycle shop. Users click a bike name and image to see more detail. This app has four components working together. tile: displays an individual item. detail: displays item details when a tile is clicked (similar to the bikeCard you just created). selector: contains the whole set of components. A container component isn’t required, but we’re using one here to help with event handling. For now, the application uses a data file to load static data for testing. In the next unit, you learn how to pull dynamic data from an org. Let’s add some files to our project that we can deploy to an org. Download the files for this app here: Bike Selector App for Trailhead. Unzip the files into the lwc directory of the project for the E-bikes demo. In this app, multiple components work together; some components are nested inside other components. Just as you nest HTML elements inside each other, Lightning web components—which are just custom HTML elements—can be nested inside other Lightning web components. In our file system, the components’ folders don’t really give insight into the relationships between them. Let’s look at how the components nested at the UI level in a diagram. The selector component lays out the page and renders the list and detail component. The list component renders several tile components, one for each bike in the data. If you look in detail.html, you see conditional rendering. If nothing has been chosen from the list, then what’s displayed is a message asking the user to choose something. If something is chosen, it displays the bike information. This nesting is achieved in the HTML for each parent component. For example, the list component has the following HTML, including the tile component as c-tile. Notice how each iteration of the bike item spawns a new tile component. Simply including the c-tile component tag makes each tile component its child. 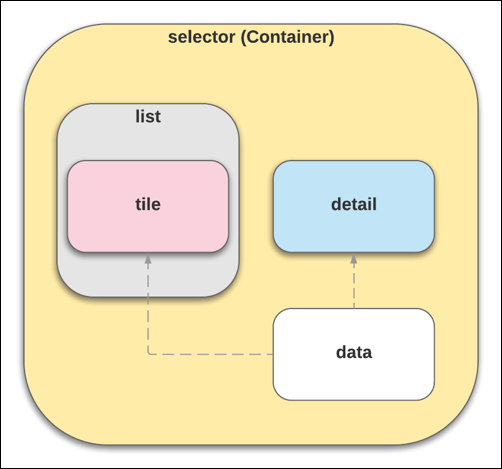 The div class definition “container” is used for styling, so you can control the arrangement of tiles. If you look at list.css, you see that it wraps the content. The parent/child relationship is important, not only for the design of the app, but also for event handling. Let’s dig a little deeper into the event handling. Each tile component listens for the user click because the tile component’s HTML (tile.html) contains an onclick event listener. In a complex component (one that contains several parent and child components) we recommend you propagate the event up through the component hierarchy, so parent components can respond to child events. If you have other child components (not the one firing the event) you can pass a property down to those children in response to the event. 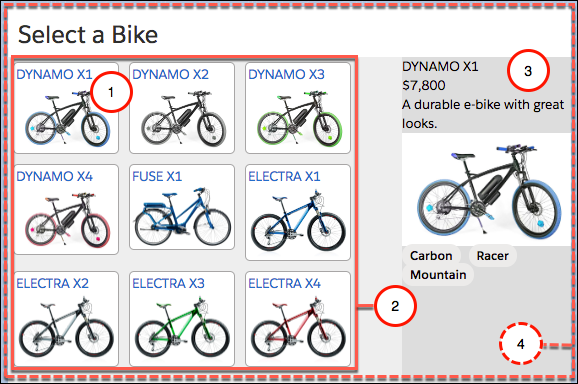 To do this, we need to chain event listeners and handlers up the hierarchy to the ebikes component. Then pass a property down to the detail component. In our example files you see the following. tile.html has the onclick event listener that calls the tileClick handler. tile.js has the tileClick method that creates a new CustomEvent object containing a detail value (this.product.fields.Id.value). List.html has the ontileClick listener that calls the handleTileClick handler. selector.html has the onproductselected event listener that calls the handleProductSelected handler. selector.js has the handleProductSelected method set selectedProductId to the evt.detail value. detail.js brings the pieces together. It uses the @track decorator to monitor the productId value. Then it uses a get/set pattern to get the value and set it to a local variable product which lets detail.html load the conditional content. Each time you click a tile, this process repeats itself. 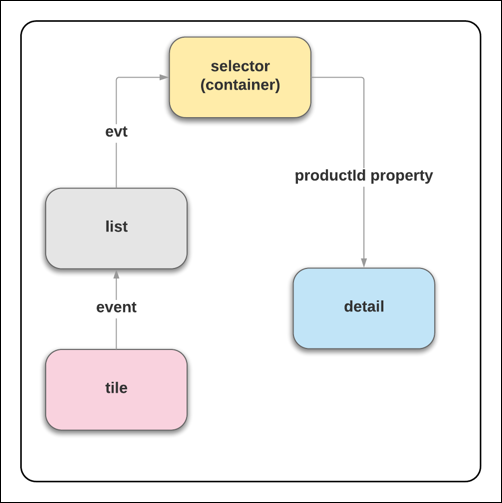 Events have properties to manage the propagation of the event up the DOM tree. You can read more about them in Configure Event Propagation. Changing the default values is for advanced event handling, and requires testing to ensure the expected behavior. Let’s deploy these files to your Dev Hub enabled org to see how it works. Using the same steps you performed in the last unit, deploy your new files, open the org and create a new page in Lightning App Builder with this app. From the ebikes-lwc directory, deploy the new files using the username for your Dev Hub org. Create a one region page using the selector component. You’ve got a fully interactive page composed of several components working together. Next, we experiment with styling and getting live data from an org.